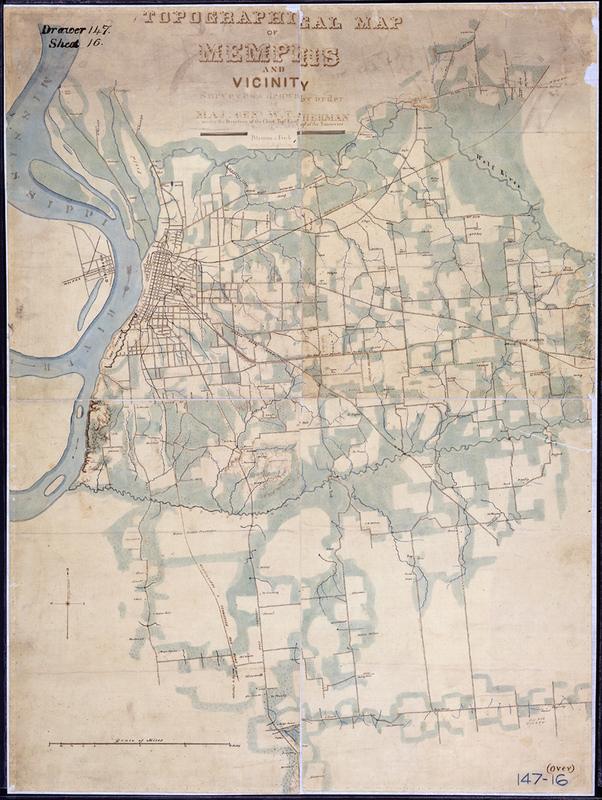 Around 1800, near the current site of the Memphis-Arkansas Bridge, Capt. 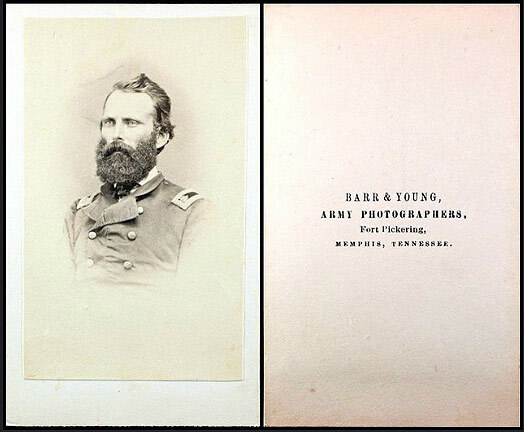 Zebulon Pike established this U.S. Army fort, named for Secretary of War Timothy Pickering. It remained as an Indian trading post until the end of the War of 1812. 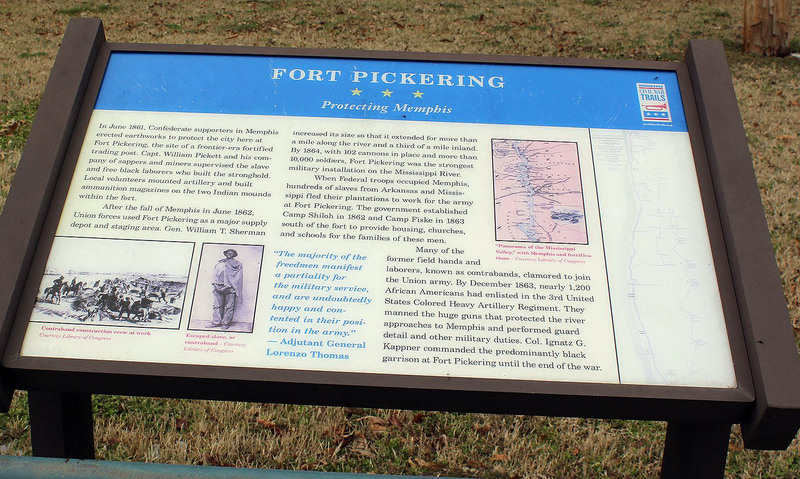 Fort Pickering was developed as a strategic command post for the Union army during the Civil War, and stretched nearly 2 miles along the south Memphis bluffs from where DeSoto Park (Chicasaw Heritage Park) is located, all the way to Beale Street. 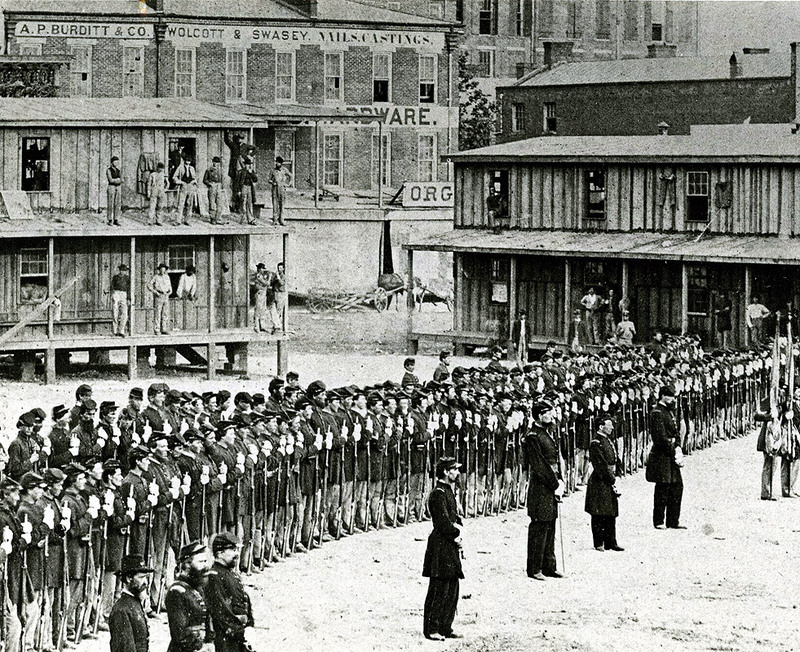 It was outfitted with 55 guns and included structures needed to serve the large number of Union troops living in Memphis and those passing through. The Indian mounds were hollowed out and artillery was placed there, along with an ammunition bunker which was dug into the side of the mound. Buildings included a hospital, rail depot, water works and a saw mill. Confederate authorities had originally established Fort Pickering in 1861, building on the site of an old frontier-era fort and Indian trading post. After the "Battle of Memphis", Union commanders took over and imposed martial law and posted garrison forces. At first it was generally a lenient occupation, in the hope of winning over secessionist citizens, who comprised the great majority in Memphis. But finding that these secessionists remained hostile and defiant, the authorities adopted an increasingly harsh policy. This included the seizure and destruction of private property, the imprisonment or banishment of those who refused to take an oath of allegiance to the Union, and the forcible emancipation of slaves. The location of Fort Pickering . There is no trace of the Fort, today. 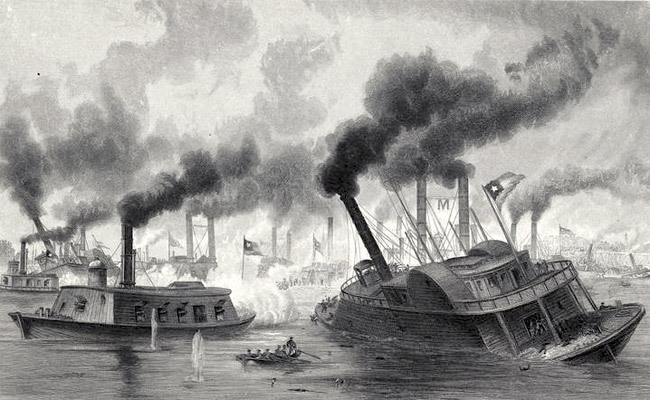 In June of 1862, a fleet of Union gunboats quickly defeated the Confederate fleet in the Battle of Memphis. 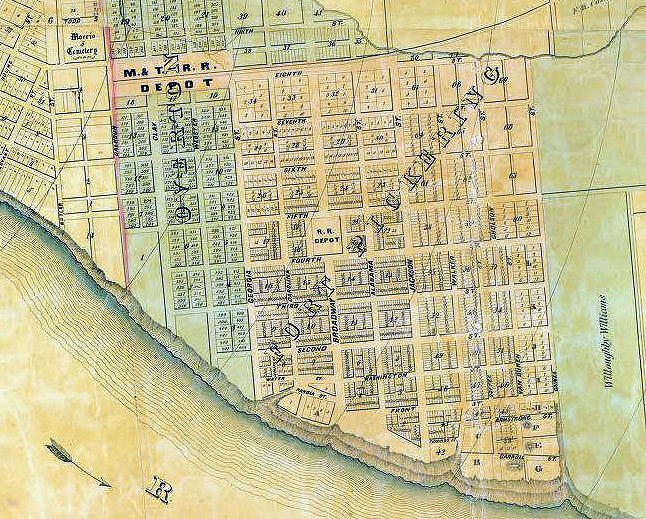 From then on, Memphis became an occupied city during the Civil War. 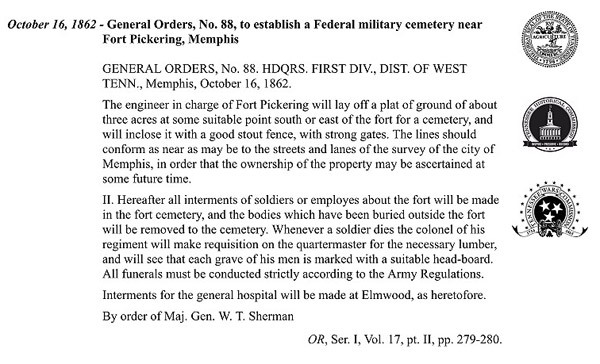 As such, the first order of business for the Union army was the construction of a new Fort Pickering on the Memphis bluffs. It was a major fortification which included a number of structures needed to serve the large number of troops who would be passing through. 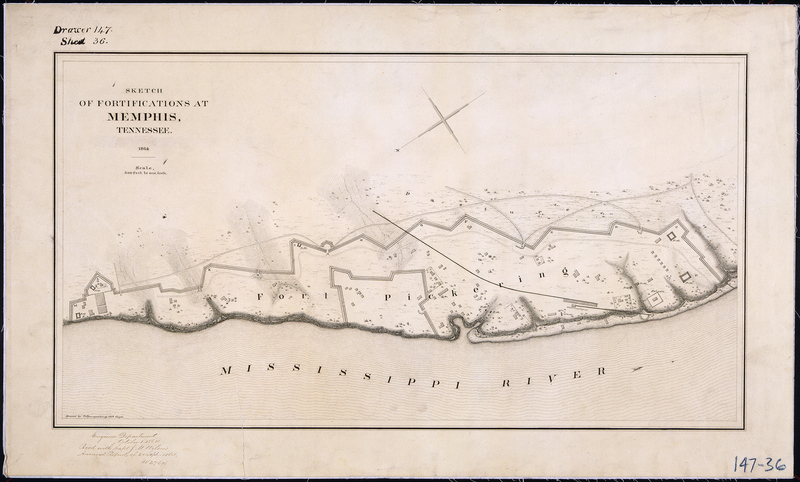 However Fort Pickering defenses were never put to the test and the Union army held Memphis throughout the war. 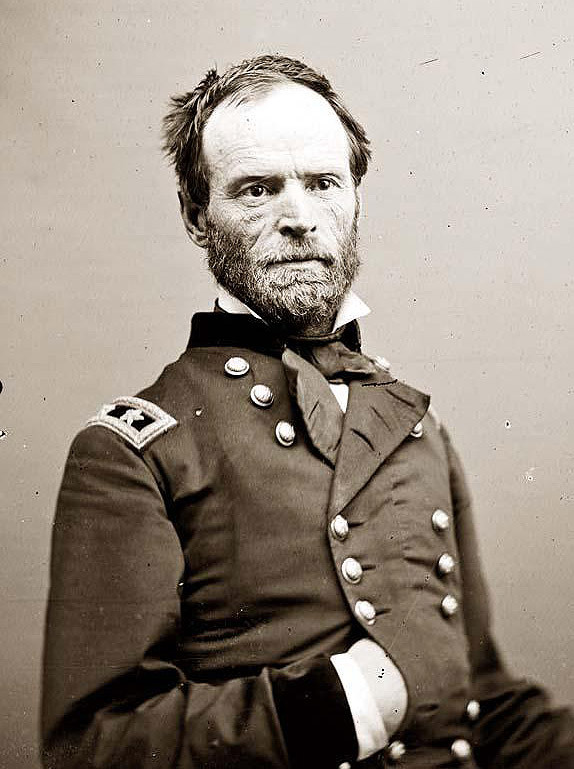 Ulysses Grant appointed General William T. Sherman as Commander of the Third Division of the Army of Tennessee. 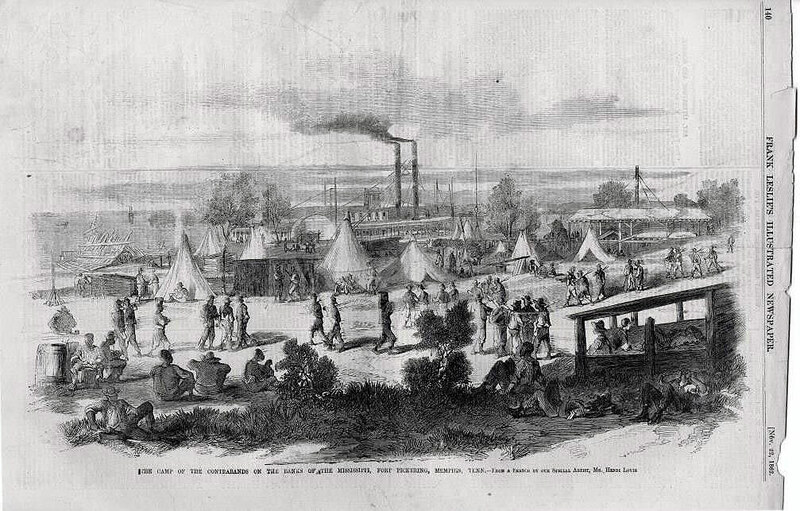 Sherman had ordered Fort Pickering expanded after the Union takeover in 1862 and the site became one of the great supply and staging areas in the West. Hundreds of slaves, escaping from surrounding states, found work here. 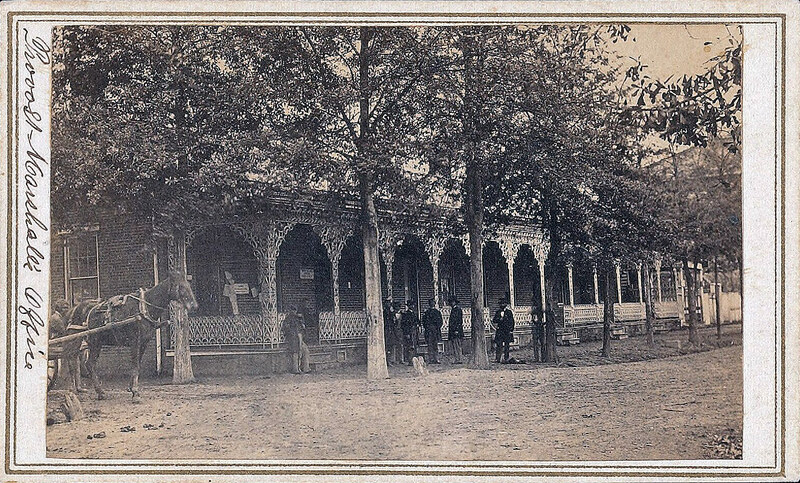 Camps provided housing, churches and schools for the men. Later, some of the ex-slaves manned the fort’s guns as U.S. soldiers. This was a rough time for white Memphians. 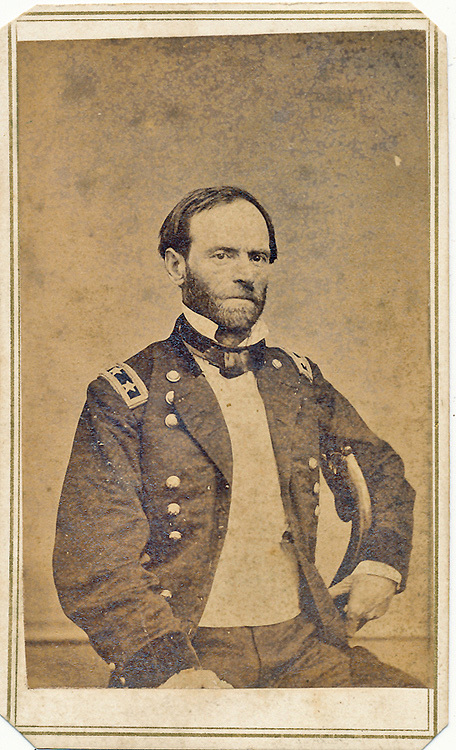 During his period in Memphis, Sherman had very little to do, so he spent the time planning his "March to the Sea". 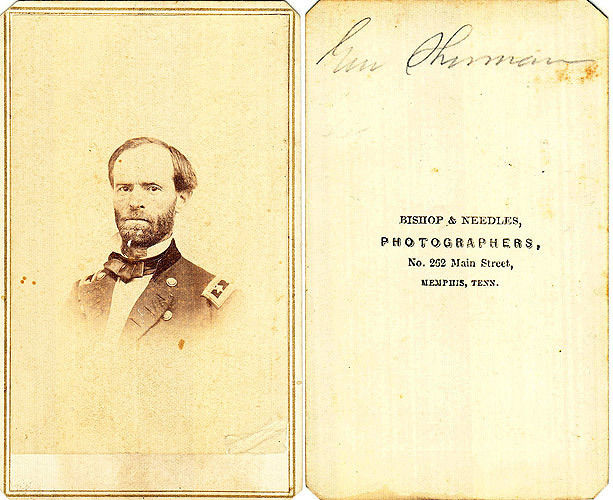 Sherman spent some time at the photographer's studios. A major discovery: We've had the old photo on the right for a couple of years. It's very bad and out of focus. In the Memphis Library DIG photos we have discovered a portion of that photo ... very large and high resolution. AMAZING! 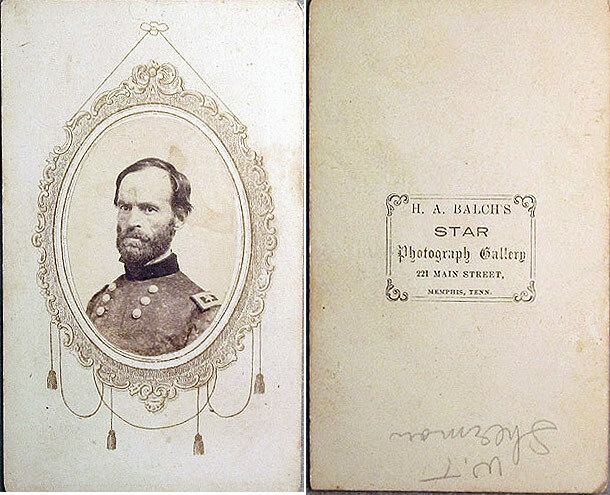 We now know the photo was taken by H. A. Balch in 1865. The names on the building have been confirmed in the Memphis Directories as being on Front Street in 1865, which would confirm Fort Pickering. <- 1. 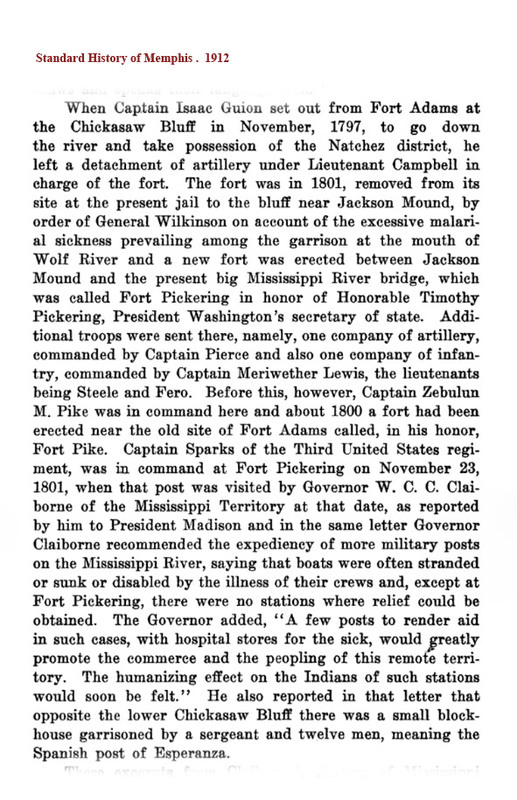 1912 Standard History of Memphis-Fort Pickering. 2. 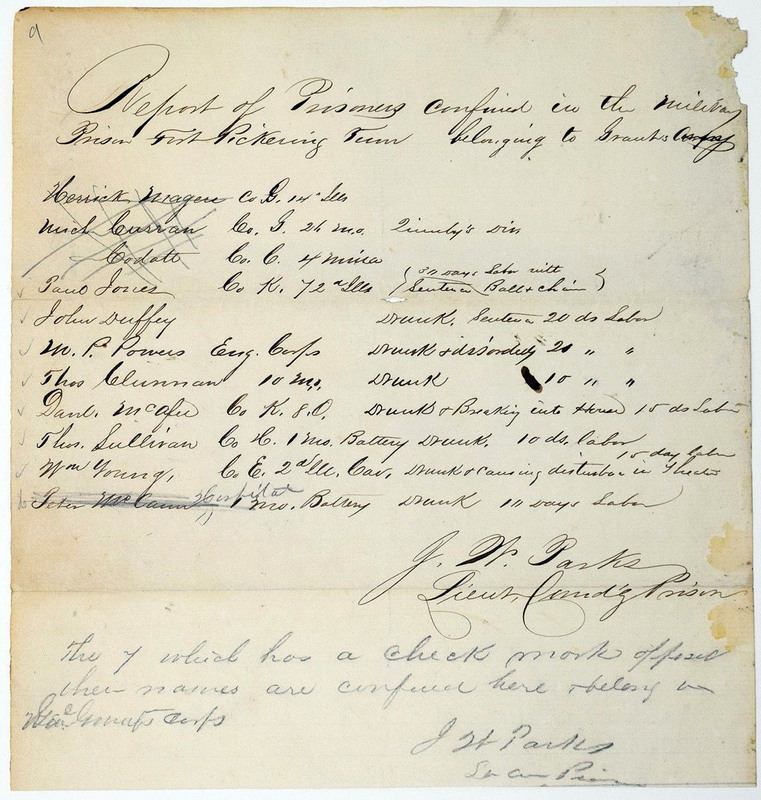 An 1863 Civil War letter from Colonel Charles Dennis Murray, Commander Fort Pickering, to General James Veatch regarding prisoners (the fort is overflowing with them), asking that they be transferred to the City of Memphis. 3. A map drawn by W. P. Eaton of the 117th Illinois Volunteers. 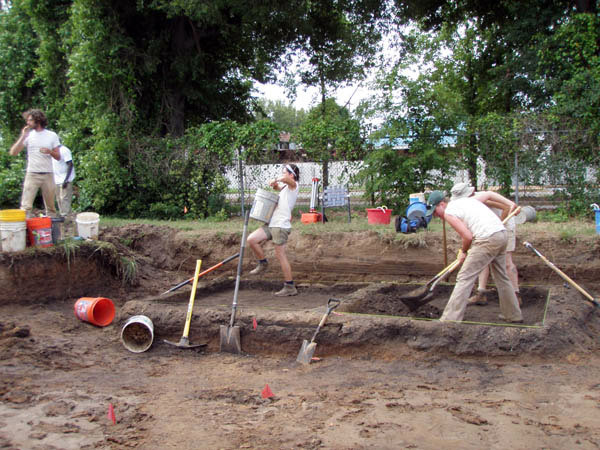 After the war, the fort was decommissioned and demolished in 1866 and all traces of the fort were removed and Memphians were happy to forgot about it - until 2007, when there was interest about the possibility of finding Civil War remnants still around. 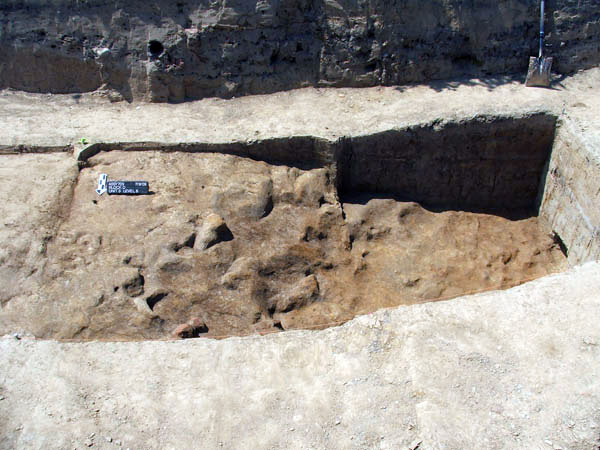 The firm of Weaver and Associates excavated trenches and the archaeologists were able to identify two cisterns, brick foundation piers, and particularly, evidence of the defensive parapet and ditch. 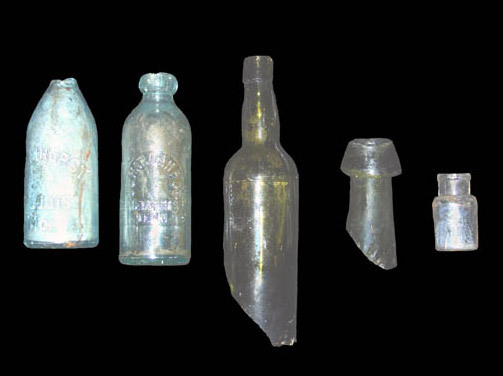 Further excavations found very few actual Civil War items. They had been thorough in the demolition of 1866. 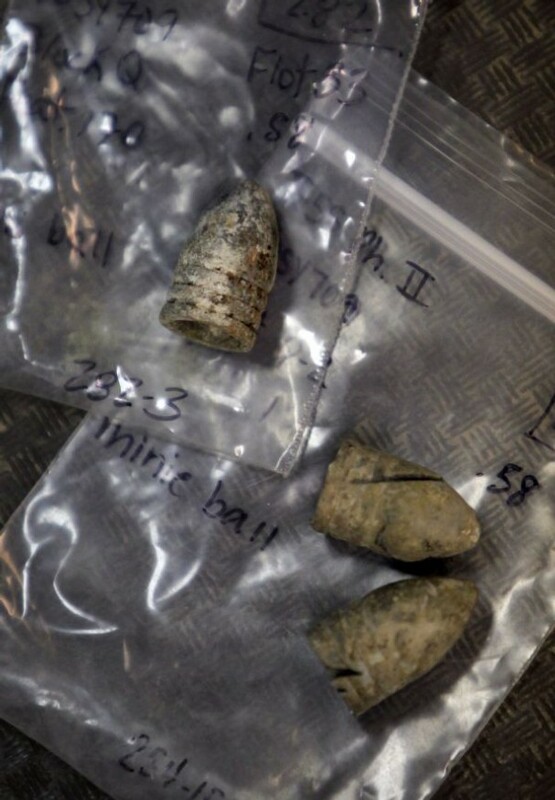 The items that were found were mostly evidence of an earlier residential area of a young Memphis. 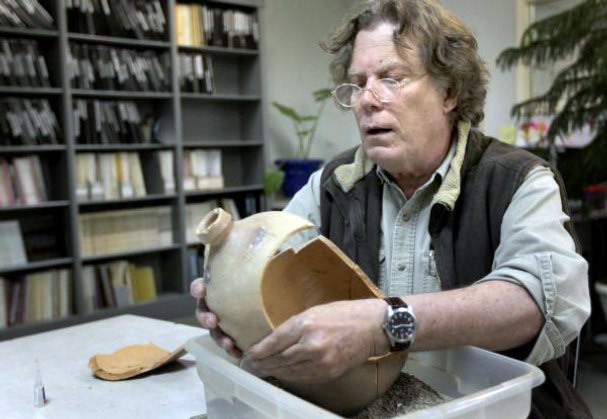 The photos below are from the dig of Weaver and Associates. 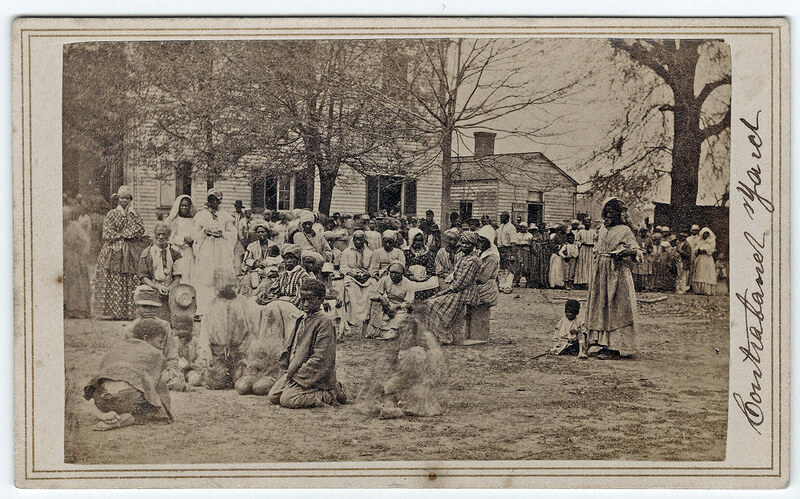 During the Civil War, 275,000 slaves abandoned farms and towns at news of the Union Army’s approach. 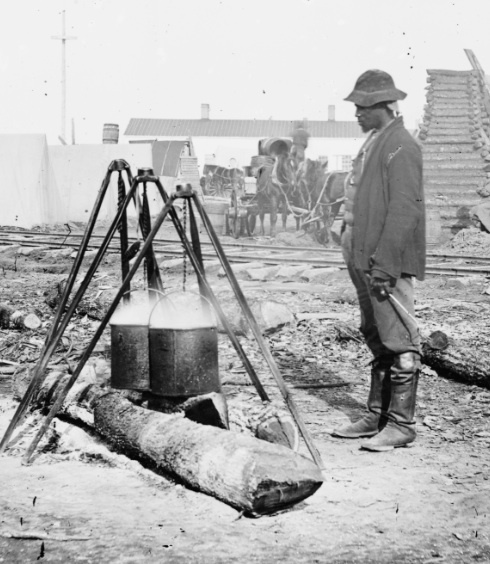 In the summer of 1862, as General Ulysses S. Grant’s army entered slaveholding territory around Memphis, hordes of hungry. poorly clad fugitive slaves surrounded them. 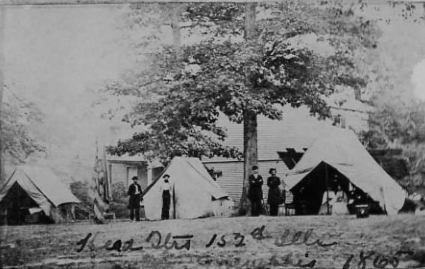 Grant ordered Chaplain John Eaton to requisition surplus tents, blankets, rations, and tools to establish a camp for the fugitives, who had been supplying forced labor for the Confederate army. 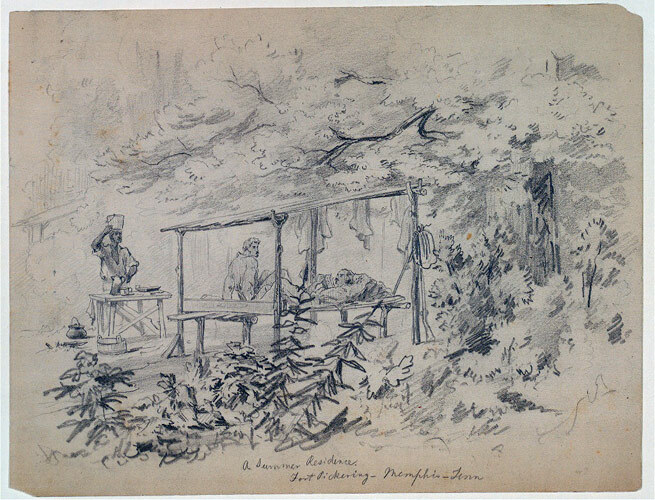 Runaway slaves were considered contraband property under the Confiscation Act—thus the name “contraband” camps, one of which was established at Fort Pickering. On the right is a very rare photo of "contraband"* at Fort Pickering, taken by photographer J. W. Taft. 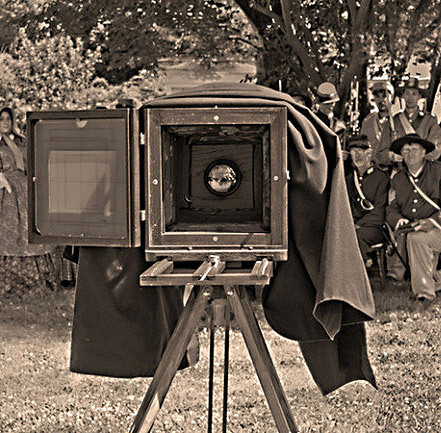 We suspect that Taft was one of several photographers who came to Memphis during the "Occupation" to record the "war" and make some quick money. Other than a few important photos, he left no other paper trail. 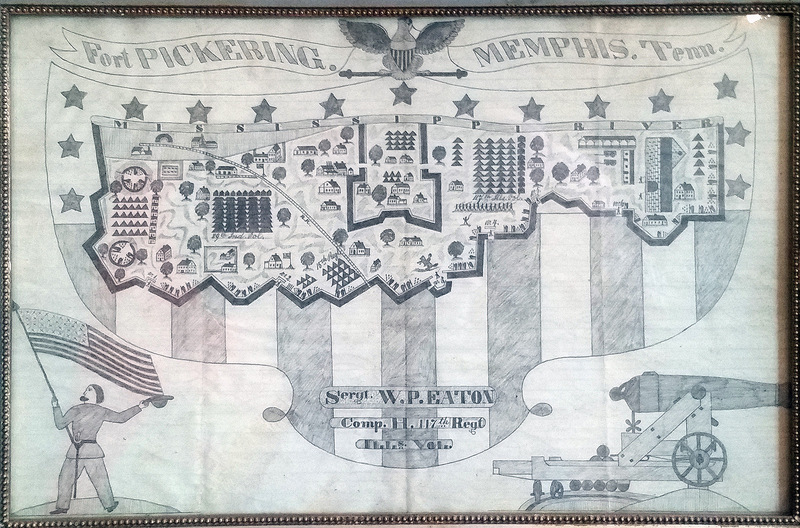 During the occupation, Memphians were not happy with Fort Pickering, especially when a "colored" regiment was established at the fort. The regiment was made up of ex-slaves and free-men. Suddenly here were some of their ex-servants ordering them around. Not the best of times! Indeed, an African-American soldier from Fort Pickering figured prominently in the beginnings of the Memphis Race Riot of 1866. 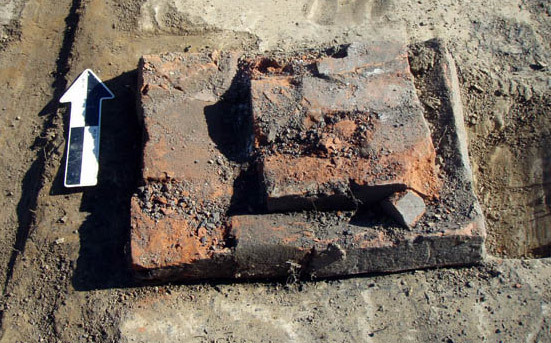 It's no wonder that when the Fort was decommissioned in 1866, Memphians wanted all traces of it removed - brick by brick. And they did a good job. 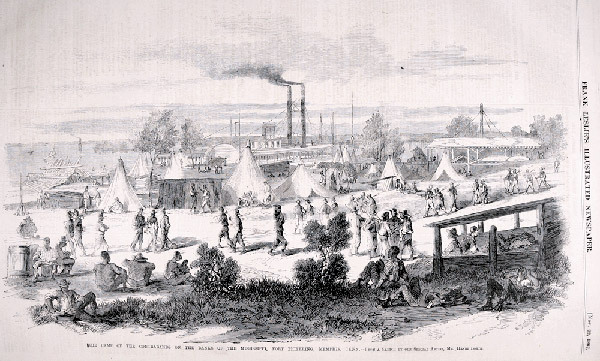 From the Website: "African American Military History of Memphis"
On April 15, 1863, orders were issued to recruit and muster into service eight companies of colored men for service as heavy artillery at Fort Pickering, Defenses of Memphis. 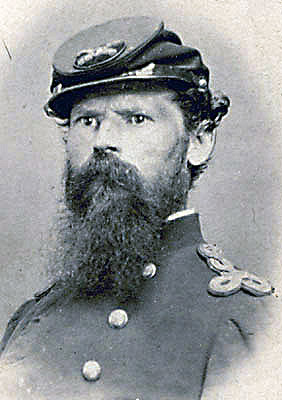 Lieutenant I. G. Kappner was appointed recruiting officer, and the instructions were that each company should have one captain, two lieutenants and an orderly sergeant, who were to be white men. The other non-commissioned officers were to come from the colored recruits. 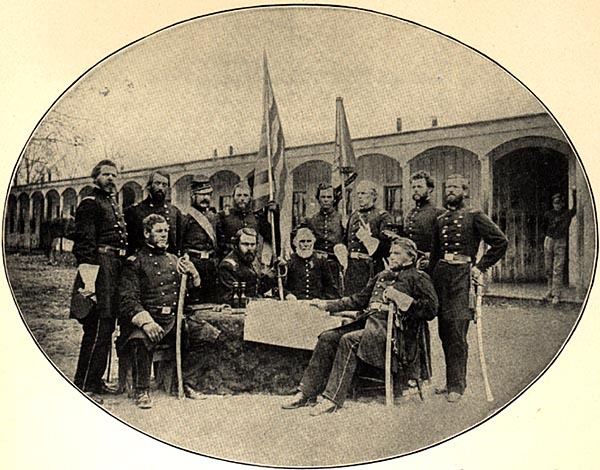 The commissioned and non-commissioned staff officers for the battalion were to be white. The pay and allowances were to be the same as in other artillery organizations in the U. S. Service. 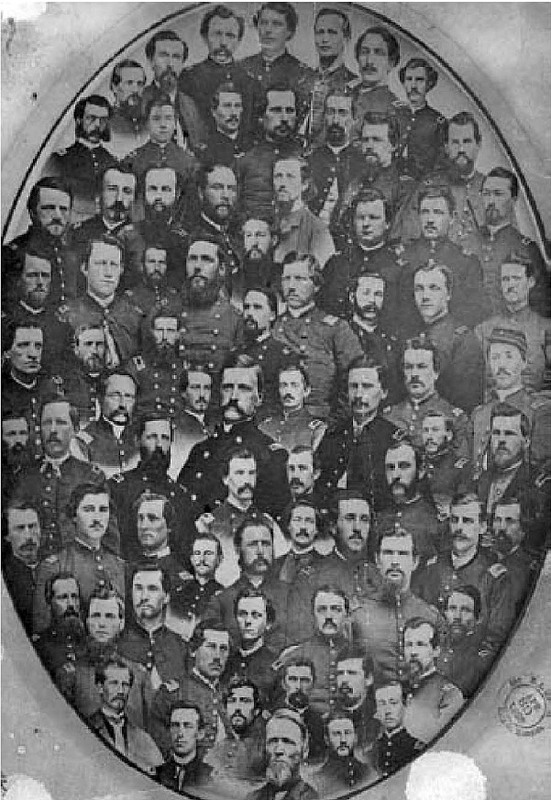 Adjutant General L. Thomas, in a report dated December 24, 1863, listing the colored troops which had been organized since April 1, 1863, listed the 1st Tennessee Heavy Artillery Regiment (A.D.) with an aggregate strength of 1153 men. 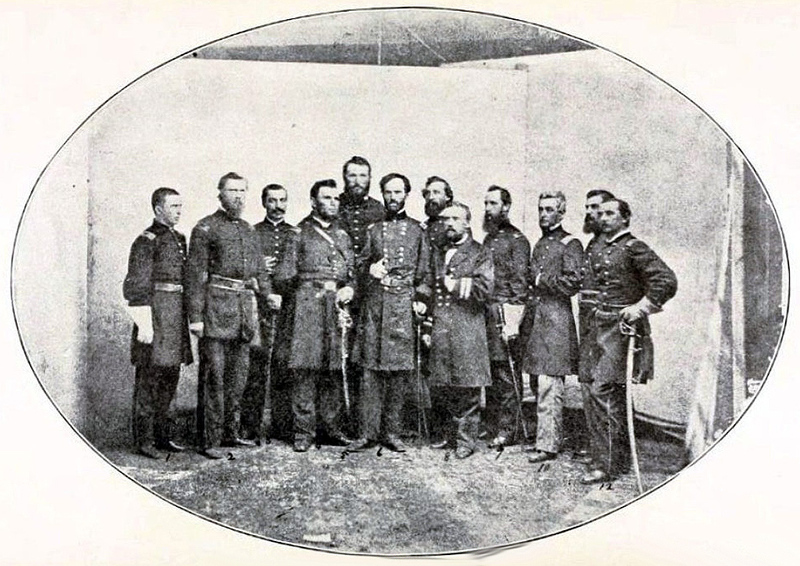 His report continued: "The majority of the freedmen manifest a partiality for the military service, and are undoubtedly happy and contented in their position in the army. 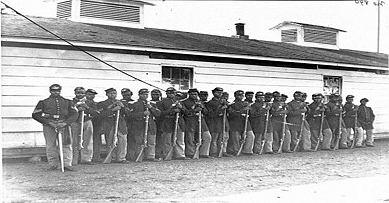 The sanitary condition of the colored troops has materially improved of late. As far as practicable all the men have been quartered in log huts, and in many cases in comfortable buildings. Every care has been taken to render them efficient as soldiers, and with success. 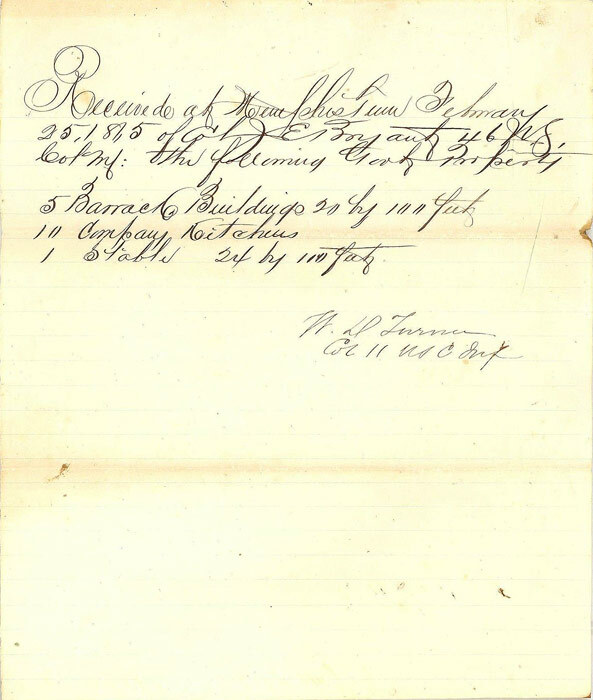 The 1865 document on the right is signed by Col. William D. Turner, Commander of the Colored troops for receipt of 5 barracks buildings, 11 kitchens, and 1 stable, to be used by the 11th division which was made up mostly of freed slaves. 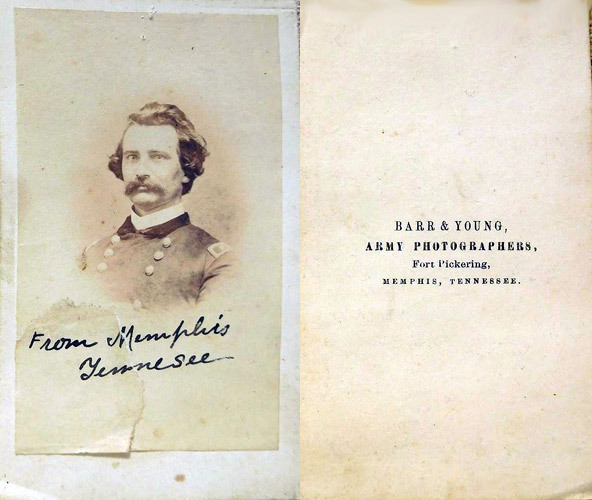 On June 30, 1863, the 1st Tennessee Heavy Artillery Regiment (African Descent) with lgnatz G. Kappner as colonel, was reported in Colonel Charles D. Murray's Brigade, Brigadier General James C. Veatch's Division, District of Memphis, Major General Stephen A. Hurlbut's XVI Corps. 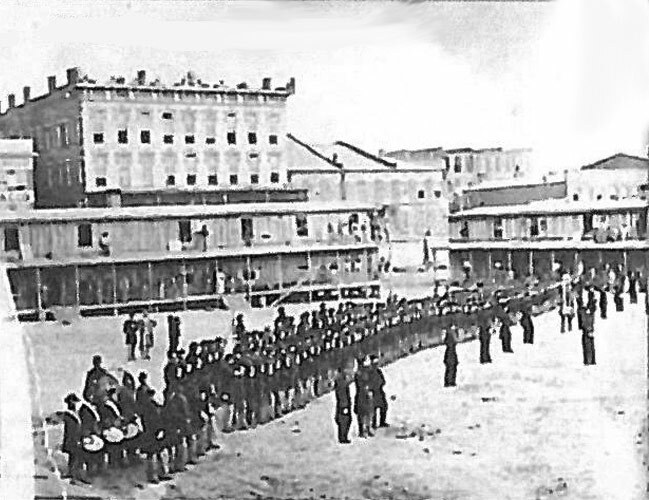 The regiment served as garrison troops at Fort Pickering, in the Defenses of Memphis, until July 14, 1865. 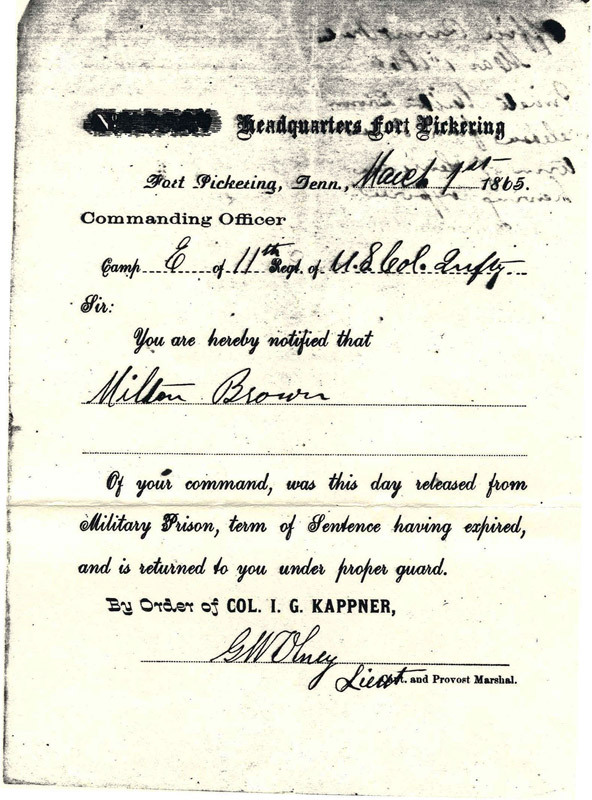 During most of this time, Colonel Kappner was in command of all the troops at Fort Pickering, and the regiment was commanded at various times by Major Emil Smith, Lieutenant Colonel James P. Harper, and Major James E. Williams. 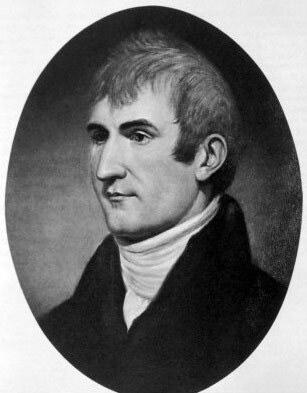 In September of 1809 Merriwether Lewis was traveling to Washington D.C. to settle accounts for Lewis and Clark drafts he had signed but which were denied by the President. Upon reaching Fort Pickering, he was acting in a crazed state and had to be restrained for several days. He was to depart on September 27, accompanied by Captain Gilbert C. Russell. On the day of his departure, he signed an $379.58 IOU note to Russell for "value received". It was probably the last thing Merriwether ever signed. On the way to Nashville via the Natchez Trace ,he died, probably by suicide, October 11. 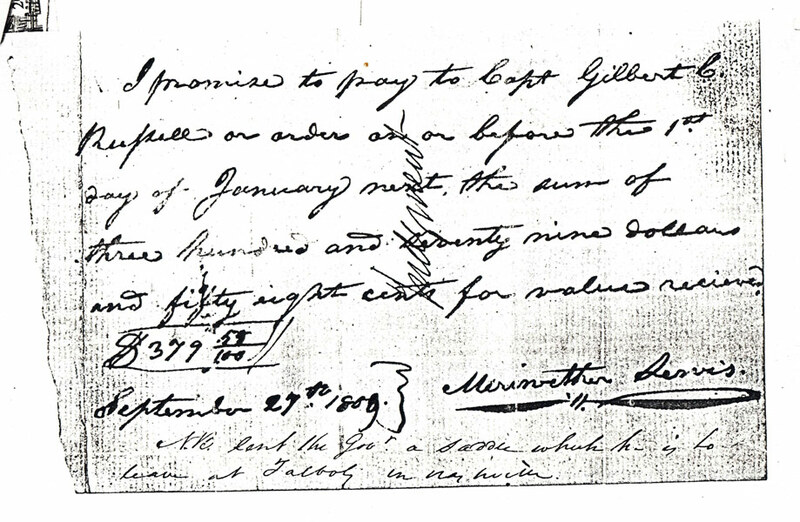 The Promissory Note reads: "I promise to pay to Capt. Gilbert C. Russell on order on or before the 1st day of January next, the sum of three hundred and seventy nine dollars and fifty eight cents for value received. $379.58. September 27, 1809. 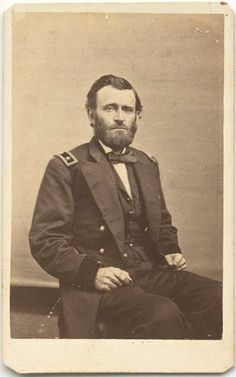 Merriwether Lewis" Below that is a notation: "NVc lent the governor a saddle which he is to leave at Talbot's in Nashville." Lewis was at Fort Pickering from September 10 to 27, 1809. He had recurring bouts of malaria which caused a person to hallucinate and to appear crazed. He was also a heavy drinker with a history of using drugs - all of which could have contributed to his demeanor. Captain Russell did not accompany Lewis on his final journey, and it is not known what the "value received" in the note refers to. There are as many people who think Lewis was murdered as those who think he committed suicide - although suicide is the official finding. Talbot's in Nashville was a B and B Tavern. 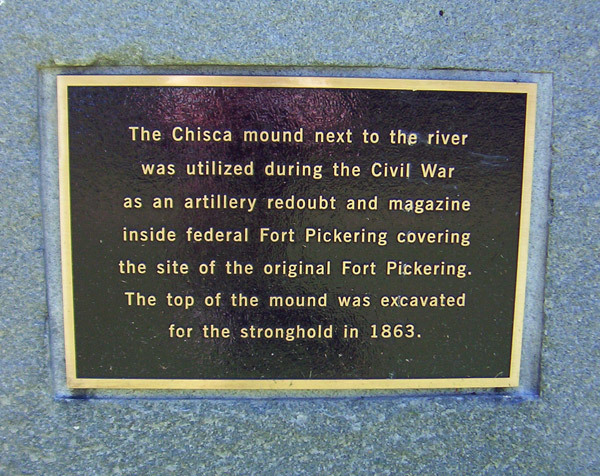 The site of Fort Pickering was once the fortress of Chickasaw chief Chisca and features two ceremonial mounds built by Paleo-Indians in the 1500s. During the Civil War, the mounds were hollowed out and used for gun emplacements and munitions storage. This area, previously known as DeSoto Park, is believed to be where Spanish explorer Hernando DeSoto first viewed the Mississippi River in 1541. Several forts, built by the French, Spanish and Americans have been located in this area. The United States’ first was Fort Adams. 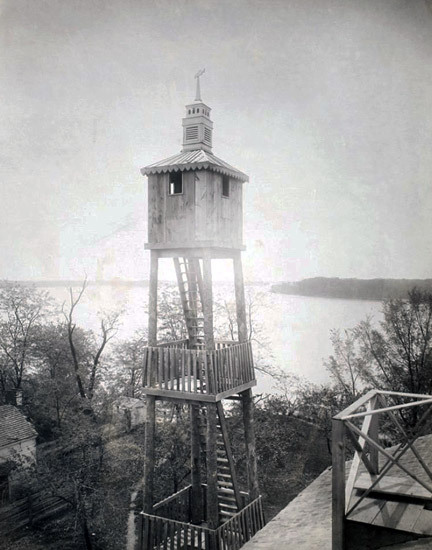 It was built too close to the river and was susceptible to flood and malaria. 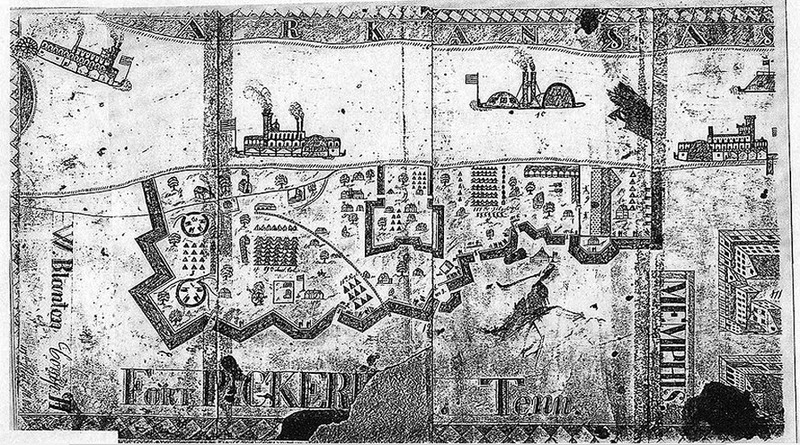 In 1801, Fort Adams was renamed and moved to just above the Indian Mounds. 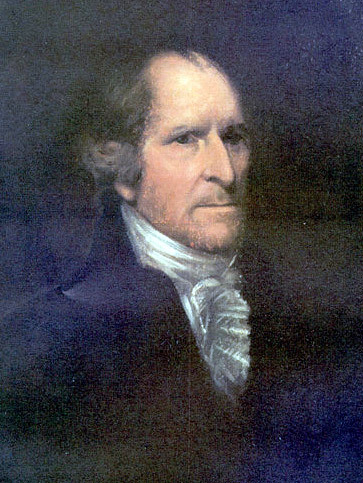 The new name was Fort Pickering, named after George Washington’s Secretary of State, Timothy Pickering. It lost it's importance after the Louisiana Territory purchase, and was practically abandoned in 1806. 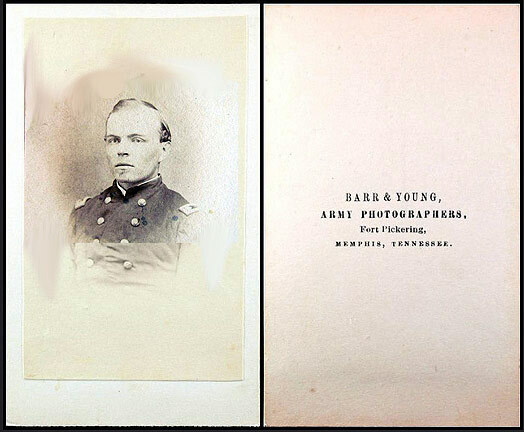 D. P. Barr and J. W. Young, Cincinnati photographers, followed Grant and their Ohio regiment to Memphis and Fort Pickering during the war - becoming the official photographers of Fort Pickering during the occupation. Because of them, as well as J. W. Taft, Bishop & Needles, and Peplow & Balch, we have many photos of Sherman and Grant in Memphis during the occupation. 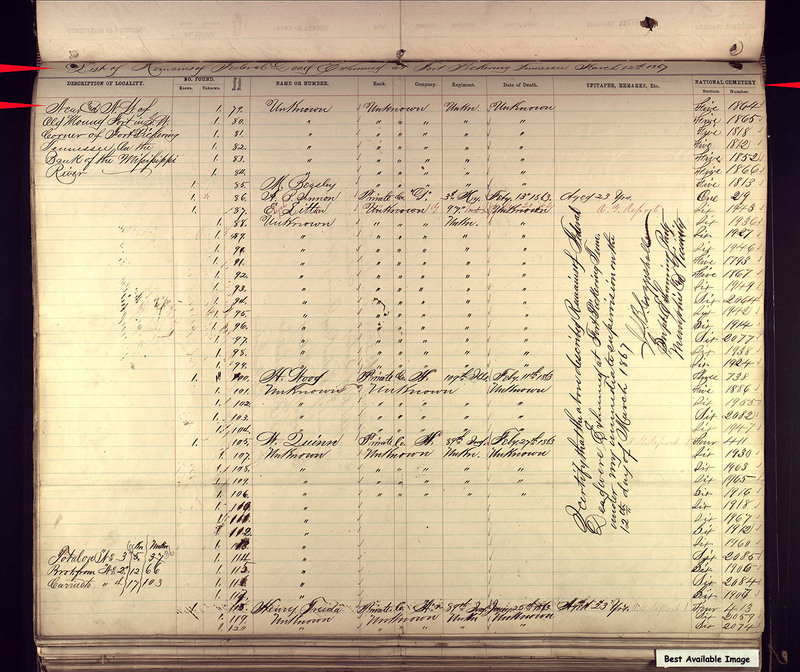 We also have a record of the many soldiers at the Fort during this period. 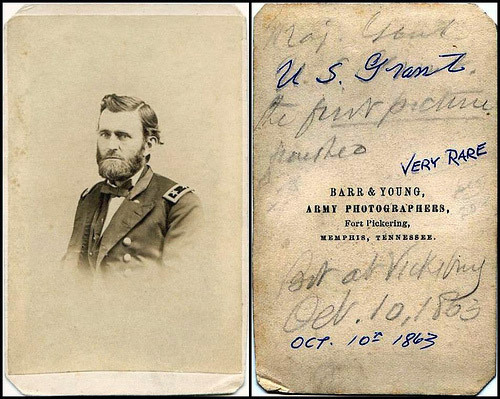 When Grant moved on to his battle at Vicksburg, the photographers followed him. A Military Cemetery was officially established for Fort Pickering. 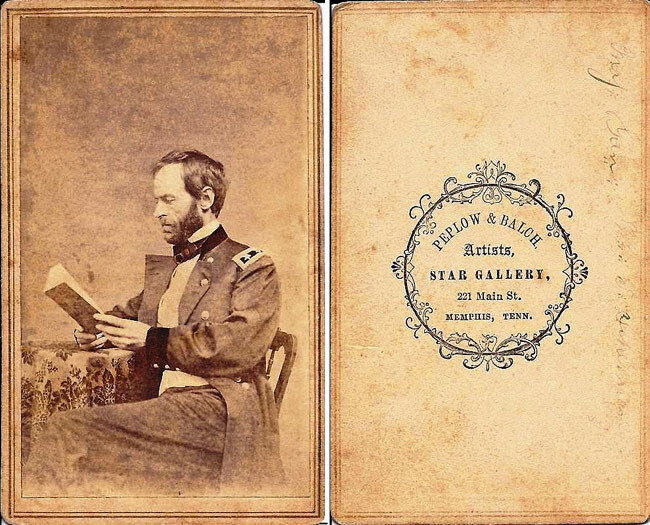 The order was signed by William Sherman in 1862. The location of this cemetery was not known until recently ... (See Below). Good Luck! They did such a great job of demolishing the fort in 1866 that even the location is difficult to find. The ONLY indication that you may have found it is this one marker near the Mississippi Bridge. You will see NOTHING reminiscent of a Fort.